Later topic: PMS COLOR HELP!!!! I recently purchased a bucket of [new in-packages] fonts of type labeled AWT and American Foundry Type Co., Inc. The type is 8, 10, 12 pt and has a channel in the bottom (foot?) where the sprue? was machined. There are two nicks, but no “pin” marks. I think AWT is a trademark of American Wood Type. I knew these fonts were not “ATF” when I looked at them. However, the Series#’s match the ATF Catalog#’s. 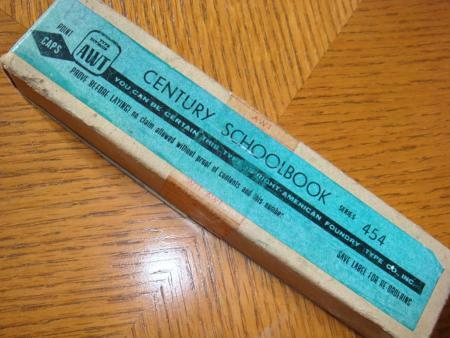 Example: Century Schoolbook #454 matches the number used by ATF for Century Schoolbook. Maybe that was a common practice. It says “Foundry Type” on the package. I have, over the years, purchased monotype from Baltotype and Quaker City and I think I understand the difference between monotype and true foundry type made with foundry metal on a high-pressure caster designed for the task. The best value of course is real foundry type. Does anyone know how AWT / AFT was made? I have read about “re-packagers” such as Kelsey buying sort lines from ATF and making up their own fonts. A friend let me see an AWT catalog and they had quite a complete listing of styles. Was AWT a retailer or re-packager for ATF, someone else or did they manufacture their own type? I think this would be a good questions for Steve Saxe. He is a type historian with a massive collection of specimen books. Send me an email and I’ll forward you his. My address is dan at thearmnyc.com. If you do find out from Steve, would you let us know what he said? I’m curious about this, too. I happen to have some new-old-stock ATF Century Schoolbook and the packaging is very similar. One thing I’d like to understand is why yours says “American Foundry Type” and mine says “American Type Founders.” The wording in the black box is different, too, as is the color of the label. Extra hard foundry type for printing - hot stamping - rubber stamps - Our hard foundry type is cast from a special formula of lead, tin, antimony, and copper. This formula enables the type to last for longer than ordinary type that will not stand up under the pressure of hot stamping or molding for rubber stamp making. If the price factor is important we suggest you use hard foundry type for hot stamping and rubber stamp making. The type isd also ideal for all printing purposes. Hard foundry type is not to be compared with Mazak type, which is much harder and far superior, since it is made from zinc, not a lead allow. In addition to this “hard foundry type, American Printing Equipment and Supply Co. sold Mazak (zinc) type, and “Star Foundry Type, which they said was imported from the Star Foundry in England. I suspect it was Monotype, not real foundry type. Whoever made it, I’m pretty sure it wasn’t American Printing Equipment & Supply. (Their original name was American Wood Type, hence the AWT initials.) Of course, anyone who wanted to use type for printing would be making a big mistake to [also] use it for hot stamping and rubber stamp making, since the heat and pressure would soon deform the type. I hope this helps, to some extent. In 1993 when we purchased the remaining inventory and records of ATF we found invoices that showed American Wood Type a.k.a. American Printing Equipment bought type from ATF. I don’t know if they repackaged it or sold it in ATF wrappers. If you checked the lower case m and the capital H it should show the ATF identification umber. I doubt that ATF would take off their ID number when casting for other resellers. was engraved at BB&S prior to 1900 and was still in production in 1993, but more importantly, there is no room on the type body as the character occupies the body from top to bottom. The practice of adding the series number started sometime in the 1930s I believe and is usually found on faces that were introduced during and after that time. It may be that if a H or m matrix had to be re-engaged, the number was added, but that I do not know. Obviously it was for the Garamond and Goudy OS as those faces date from the teens. While it serves as a nice check and guide, a series number is but one of a number of clues for determining if a face was cast by ATF. Kelsey did. Kelsey was also a very significant buyer of ATF type and they would repackage and refont it under their own brand name. As a young printer back in the 1950s, it came as a shock and surprise to me that Kelsey would stoop to doing this, but I still have a letter from Jan van der Ploog at ATF confirming this after I had sent a letter of inquiry to ATF. I later came to respect the ATF quality, and when I acquired a large collection of BB&S type some years back, I was equally impressed by their level of quality as well. Interestingly, in their ‘71 catalog, AWT refers to what is usually called “Lydian” as “Lydian 666” (ATF’s number for the font). So I think it is reasonable to assume that some or all of the AWT type was manufactured by ATF. I wonder if this is the last info on this subject? 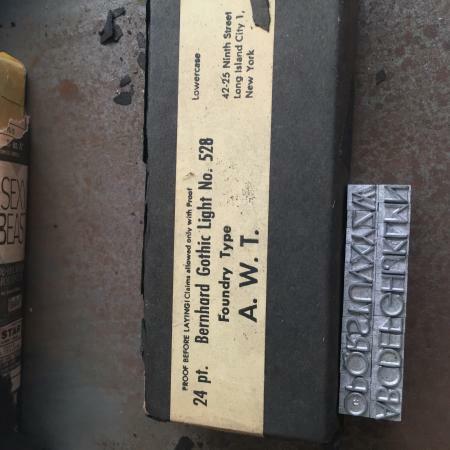 Distributing some Bernhard Gothic Light type into a case I became intrigued by the labeling stating ‘Foundry Type AWT, providence Long Island City whilst the maker’s mark statesPhoenix Foundry. Please see pics. Packaging looks feels original and type is unused. Interested in knowing the story here? Interesting to read one’s old posts from a few years ago. In dealing with AWT and its various names plus Charles Broad who ran the Type Founders Phoenix operation, we are talking about the fringes of type casting. There is probably no definitive answer on some of these questions at this point in time—the pin mark is for real, AWT was all over the place, and ATF cast and sold to anyone who would pay the bill. I had forgotten about AWT’s imitation ATF package. As Theo Rehak often told us at his Dale Guild, ATF was out to sell metal, and at some point in time casting and selling type became a matter of survival as the market dwindled and basically disappeared. Always worth trawling archives first. Yeh I guess the metal just had to be shifted as the writing appeared on the wall. Who know foundries may packed in rebadged packing just to shift it off the premises. Well it’s now distributed in my cases in Sydney Aus. until the time I may need it! I picked it up from Jim Heagy in San Francisco in early 2000. The “Typefounders 24 Phoenix” mark originated, as Fritz noted, with Charlie Broad’s “Typefounders, Inc.” of Phoenix. 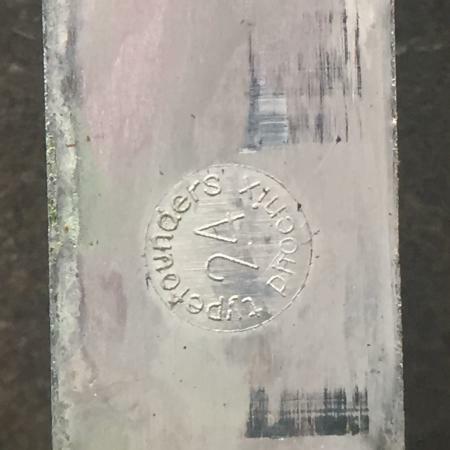 It is not a real pinmark - that is, it’s a real mark on the type, but it is not produced by the “discharging pin” (so called) of a pivotal type caster, which is the only type casting machine which uses a pin as a part of its function. Rather, it is a faux pinmark produced by modifying a Monotype-Thompson Type Caster “Type Body Piece” (aka “point blade”) and adding a functionally unnecessary pin to produce what looks like a pin mark on the type. Two point blades modified in this way survive. I acquired them both with the last of the typecasters from the former Barco type foundry in Chicago. I kept the 18 point example and gave the 24 point example to Sky Shipley (Skyline Type Foundry - as he has the largest stash of ex-Broad matrices around, it seemed fitting that he should have one). and scroll/search down for Typefounders, Inc. (Phoenix). So your type could have been cast by Charlie Broad / Typefounders, Inc. Or by the advertising typography firm in Phoenix with which he often worked (I’m forgetting its name - Fritz would know right off). Or by Los Angeles Type Founders, who acquired Broad’s operation. Or by Barco T.F. / F&S of Chicago, who acquired LATF. For that matter, Sky could cast you brand new type today with this mark - he’s got the 24pt blade and the mats for 24pt Bernhard Gothic Light. I acquired something else quite interesting from Barco - in a bag of rubber stamps, the rubber stamps which say “NO 4 HARD FOUNDRY” and “HARD FOUNDRY TYPE” (I’m writing from memory - the wording may differ slightly). These genuine rubber stamps are very useful, and indeed quite magical, for they possess the ability to alter typemetal composition. A few years back I had the opportunity to have type from a package so stamped analyzed - it was very nearly Linotype alloy. The fringes of typecasting can be fascinating. Charles Broad came to Phoenix from the Chicago area and had a working relationship with Morneau Typographers. They were a regular hot metal operation with line casters, a full Monotype shop and a large selection of hand set type. They advertised the Monotype plant in about 1989 in Type and Press and I ended up buying the Monotype part of the operation, less any Thompson casters that went to someone in Michigan before I got to Phoenix. Broad’s stuff had previously sold to LA Type after his death by his daughter, but I ended up with several boxes of Broad’s paper material and a couple of boxes of non-Victorian display and cellular mats that were a mix of stuff from Morneau and Broad. All of these guys bought stuff from other casters as they died or went out of business. I have material in the Morneau collection that came from Archie Little, a Seattle typographer of some note who was active in the 1930s probably into the 1950s. The only machine we have operated is Morneau’s sorts caster that is an excellent caster. And the Morneau plant had been condemned by the City of Phoenix for a new entrance to a fire station they were building. I have a limited variety of type from your sorts caster. It seems to be of quite high quality!